We almost always have to travel for the two major holidays at the end of the year. While we enjoy being with family, dealing with the stress of having to take enough food to cover all your needs in a non gluten-free house is not always welcome. What works well for me is to do almost all my holiday cooking before I ever hit the road. Below is what's 'on the menu' for me in a few weeks. Christmas eve dinner: gluten-free lasagna, Italian side salad and garlic bread. I make a small batch (that offers two nice sized servings for me) ahead of time and freeze it. If I'm in a generous mood after I'm good and full, I'll give the left overs to the husband. Christmas morning breakfast: Pancetta and Gruyere cheese egg casserole and pumpkin muffins. Again, I make two servings ahead of time and freeze. When I get where I'm going, I put previously frozen items in the fridge and they're ready to heat up by the time I need to eat them. Christmas dinner: turkey (no gravy as I don't care for any type of gravy with or without gluten in it), cornbread dressing, green bean casserole (homemade onion rings last for two weeks in air tight container), sweet potato casserole, whole berry cranberry sauce (from a can) and last, but certainly not least, pecan pie! To make sure my food stays gluten-free from cooler to table, I make sure and follow my own protocol to prevent cross contamination. These tips work well any time of year. Take your own butter in a labeled container so no one puts their crumb laden knife it it. Take mini foil sheets (I get them at Dollar Tree) to line pans and racks in oven or toaster ovens when heating bread, muffins, etc. Take small packs of snacks and sweet stuff so you don't feel deprived having to pass on a dozen gluten-filled desserts. Don't apologize for the fact that you can't indulge in Aunt Amy's cake or pie or dressing. Doing so implies that you have a choice in the matter - if you're gluten-free because you can't eat gluten that's far from true. Don't feel bad if you can't share your expensive gluten-free food (like donuts, cheese straws, cookies or pie) with others. If they're not sharing with you (because they don't have gluten-free foods to share), you don't owe them anything. Do enjoy the holiday and all your fabulous gluten-free food! OK - some of you have noticed that I'm now posting on this website regularly after a VERY long hiatus in 2013. Even though the reason for this has nothing to do with the gluten-free world, I decided to share some info about an off topic subject (real estate) in case it helps someone else down the road. We lived in Gwinnett County for over 18 years and for the most part, it was fine. And then one day, it wasn't. Without going into detail, let's just say the time came when we had to move so we did. And moving out of Gwinnett was by far, the best decision we've made regarding real estate. But this post is not about that area - it's about how real estate agents will take advantage of you if you let them. We interviewed five agents in all (2 via phone only and 3 in person) before deciding to work with a neighbor who had less experience than anyone else we talked to. And that turned out to be a VERY good decision as well. One agent who was clearly very successful wanted us to sign a 6 month sales agreement and pay a fee if we broke it.... I didn't want buyers (strangers) invading my house for a month so anything over three months was totally out of the question. NEXT! Another agent walked into our house and asked if our on-site stained REAL hardwood floors (that people could not believe the gorgeous condition of) were real....AND low balled the proposed sales price by over $20K. She'd listed our house as a 4BR (in a proposal) when I'd explained in writing, on the phone and via email that our house was a 5BR house and that's the way that Wieland built it. Somewhere along the way someone mislabeled it as having 4BR years ago and well, you know what they say. You can't kill bad info on the web. NEXT! Another agent (that I only spoke to on the phone) tried to convince me that the finishes in my house (from the hardwood color to counters to cabinets to tile) were all wrong and unfortunately, my house was not worth nearly what I thought it might be. NEXT! We ended up working with a neighbor, literally, who dabbled in real estate on the side. That's right. We chose that route over giving the other pushy, seemingly scare monger realtors a dime of commission. Below is what happened next - I still at times have a hard time believing it all turned out this way. But in fact, it did. Home gets listed on the market late - around 2:30 pm instead of the 9 am scheduled time. Someone doing the listing for the broker was sick...blah blah. Before 3:30 pm, we had our first showing - for 6:30 that evening. It was freezing cold and raining on a Friday night in February...we went out to dinner and returned home to find every single light in the house on. The next morning, I had an email from our agent - an offer had come in at 9:00 pm the night before. Let's see...that's less than 7 hours after the listing was posted. Not bad....at all! The offer was less than our asking price so we didn't reply. We had 10 days to do so - so why rush? Later that day, we got another showing set up for the following morning. We went out to breakfast and after the second showing we never heard zip from that agent. Then something remarkable happened. The people that made the first offer must have been concerned that we were getting a better offer so they came back and upped their offer without us throwing out a counter to them. Can you imagine??? It's was seriously crazy - but in a fabulous way! So, we signed a sales agreement less than three days after the house hit the market. The only problem was we had nothing to move into. We ended up renting our house back from the buyer for just over three weeks (for less than our old mortgage). By the time we had to move out, we still had not found a house we wanted to buy. And so we moved into a rental home and continued our search. In the end, we found a house that's just right for us (if a little larger then we need) in a much better area for gluten-free dining, shopping and living. The reason I thought it was important to share our experience is simply because I think way too many people trust realtors when the truth is that MANY realtors will take advantage of sellers if given half a chance. Please note I'm only speaking of realtors in our area as we've only bought and sold houses here. Something similar to our recent transaction also happened on our first home sale years ago. Don't let people convince you of something that is not true unless you don't mind losing a LOT of money in real estate deals. Most of the time, I really don't think it's that difficult to be gluten-free. Seriously - I don't. That's probably because I live in an area where there are very few things I can't find delicious versions of (think donuts, bagels, cookies, pie crusts, crackers, cakes, cheese straws, cinnamon buns and much more!). And I can't possibly find time to dine out at every place that offers exceptional tasting (and safe!) gluten-free meals around here. But when the holidays roll around, I often find myself feeling irritated in a way I don't feel good about. I tell myself it's only one meal I have to deal with making all my own food for. Since I have two other gluten-free family members, only the events with people other than my family are somewhat challenging. Still, it's only one meal for the whole year - how hard can it be? Well OK....it's actually three meals if you count Christmas Eve and Christmas morning.... Oh yeah - that is annoying. 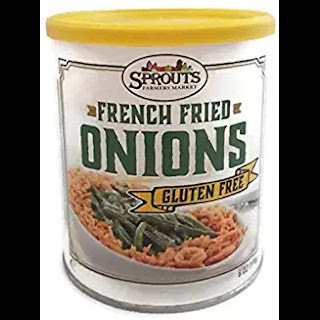 If you've been gluten-free for a while, you might be wondering if I don't understand that my gluten-free-free dressing, green been casserole (with homemade fried onion rings), sweet potato casserole and pecan pie are as good as any gluten containing version of those dishes are. I do know that, of course. However, many people who are not gluten-free are afraid of gluten-free food. Therefore, mentioning a small change of ingredients in a family recipe during the holidays is not always a good idea. I've personally found it's usually best to make/take your own food, don't share if you don't feel inclined to, and call it a day. This way, you're not upset, sad or annoyed that you can't have any 'fill in your fave holiday dish here' during the holiday meal. And that makes for a much nicer holiday for you and those around you. What's interesting to me is that people who have no dietary restrictions or allergies have no idea what it's like to go without foods everyone else is enjoying. They don't have any idea how it feels when others act as if it's not an issue. Oh wait...it isn't an issue....for THEM. It's our issue and it will always be that way. And that is why it's beyond wonderful to enjoy holidays with other gluten-free people in your own family. At least that way, you'll hopefully have one holiday meal where you don't have to make all your own food. And that is an absolutely beautiful - not to mention delicious - thing! Forget everything you think you know about fruit cake - with or without gluten in it. If you're a fan of really good fruitcake and can't eat gluten, I've got great news for you! You can order an absolutely fabulous gluten-free fruit cake from American Gra-Frutti even if you can't buy one in person at their Roswell, GA bakery. Check out all the great product options here. Get your order in soon to make sure you get it in time for Christmas! While you're at it, you might want to order some killer cheese straws (regular or spicy!) if you can do dairy. Those are available from Marilyn's Gluten-Free which is a line within the American Gra-Frutti brand. Those straws are over-the-top fantabulous! If you're lucky enough to be able to buy the Peachtree Pimento cheese spread from this line, be sure to stock up for the holidays! Whole Foods seems to run out around this time of year because they don't get that they need to order more to stock up for the holidays. That stuff is great on bread, crackers and celery sticks - and it makes killer cheese grits! Full disclosure here - I work with the great team at Delight Gluten-Free Magazine. But even if I didn't, I would be amazed by this gorgeous cookbook! It has pretty much everything you'd be looking for in a cookbook - fabulous recipes for everything from starters to entrees to snacks to desserts. They just all happen to be deliciously gluten-free! If you're in the mood to bake your own bread, rolls, pizza crust - you name it - it's in this cookbook. I'm just not that into baking bread since I can buy so many types from the fab gluten-free bakeries in the Metro Atlanta area. This is a terrific holiday gift for the gluten-free cook in your life - or of course - for yourself! *Special thanks to Delight's Editor, Vanessa Weisbrod, for her dedication to living life deliciously gluten-free every day. And for helping me relish in doing the same!